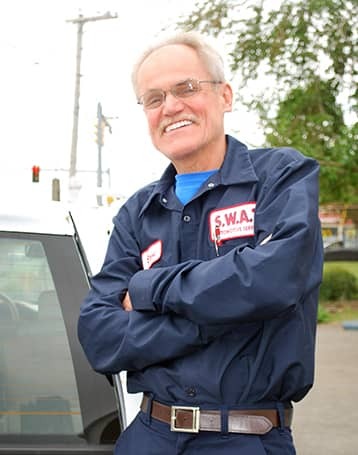 If you want your car to be serviced by the best mechanics in the area then go to S.W.A.T.. I have been a customer for years and will never go to another repair shop. I know the work done at S.W.A.T. is reliable, and guaranteed. The cost for the repairs are what I would expect to pay for quality work. Who wants inferior work?!! Steve, the owner, always makes sure that I understand what the car needs to perform well whether it be a safety issue or a performance issue. I want my car to run great and to last a very long time. Great place! I had a fantastic experience with this shop. They were able to squeeze me in as soon as I told them that my check engine light went on, and diagnosed the problem very rapidly, within an hour of my pulling into the lot. They gave me options about what to do, explaining what was wrong using metaphors that made sense to someone who knows ~nothing about cars. They gave me cost estimates in advance and were incredibly friendly. I sent my car there couple times now. Their service is excellence and reasonable priced. In fact, I got the cheapest timing belt changed. He shown me what had went wrong before & after. Steve is truly honest and professional. Detailed oriented. Go There! Upon request, you can drop your vehicle off after hours.